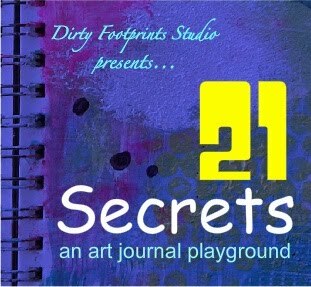 If you are at ALL excited about the 21 Secrets: An Art Journal Playground Workshop, you can NOT miss this opportunity. Think about this for a minute with me. You win Twenty-One different workshops from Twenty-One different artists -- enough information to get even the most fearful novice a huge push into creative living. Not only that, but you have the opportunity to drive traffic to Your blog by offering this exceptional giveaway to another person! Right now I can fully attest for the workshop I am offering, The Secret of Beginning ..... I have put countless hours into this. I'm not kidding. My hubby & kids have kind of forgotten about me and I have made a permanent bum imprint in my desk chair. Discussions, materials list, videos, PDF....OODLES of goodness to take you on the page and into YOUR life. Beyond that, you get access to TWENTY other workshops - all in one place. Please take just a second to look HERE at everything that is offered. FYI I'll be making a little teaser video for my workshop. You know me - I love to tease.